Every child should be able to spend their time outside on a sunny and warm day. Without having to leave your home, the perfect place for healthy outdoor recreation is a safe and fun backyard. But if your backyard is unattractive, your kids won't want to play in it much. Worry not! Today we've got some awesome kid-friendly backyard ideas that your kids and the whole family will absolutely love! 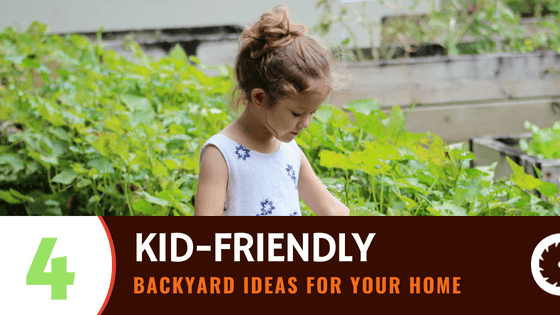 You have to keep in mind that having a big backyard means that you have plenty of opportunities to adjust it for the better enjoyment of your kids. That shouldn’t be too complicated if you already know how you want it to look. 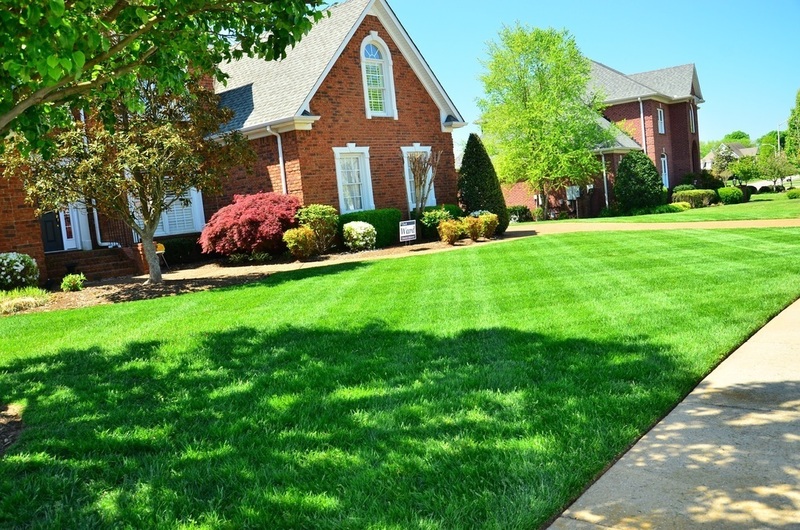 If you aren’t comfortable with the idea of transforming your backyard alone or you don’t know where to start, you can always hire professionals that know how to provide good-quality lawn care service. However, before you hire a professional, I want to share a few ideas on how to make your backyard the best place for your kids. 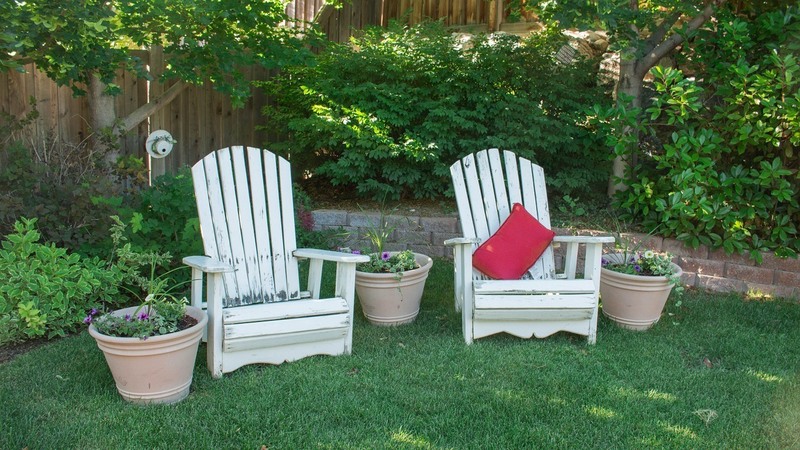 Consider the ideas I'm about to share (and consult with professionals, if needed) and you will be ready to turn your backyard into the best backyard in the neighborhood, quickly and effortlessly. If you have a big backyard, stand in it for a few minutes and visualize how you want it to be. Do you want a section for grownups and another for the kids to play and have fun? Do you want to put a small garden in the corner or do you want a spa resort feel in your backyard? You can do all that. All you need to do is to see what your dream backyard looks like. If you aren’t sure of what to do, you can always hire an expert who can give you advice or even design the entire garden just the way you want it. The best idea —no matter what you do— is to have different areas. You can mark the different sections in your yard with attractive plants, or you can use a fence so your kids can see the border between the playground and the other part(s) of your backyard (for example, the garden). That fence will remind your kids that they can play on one side of the backyard and that the other side is for grownups. It is not a restriction, just a reminder. The main difference is that kids can enter the area on the other side of the fence, but when they want to play ball or run around, it is better for them to be on their side. A reminder like that is a great way to show your kids that they have to respect other people’s areas and decisions, too. The best part is the fact that they will achieve this by playing and having fun. The fence around your backyard offers safety for your children and privacy for your entire family. If you want, you can transform a few fence panels into a playground area for your kids! Confusing? It's actually pretty simple. You can paint one of the panels and turn it into a blackboard. It is not hard, all you need to do is visit your nearest hardware store and get a special type of paint. That paint can turn every surface into a blackboard, but you have to put few layers of it on the panel. If you have a metal panel, I suggest you buy a wooden panel and fix it on top of the metal one. A wooden surface is easier to paint, especially if it doesn’t have special finishes on it. A blackboard will keep your kids busy outside because it can be extremely fun, and the best part of all is the fact that they can easily clean it once they've finished their drawings. Just remember to take the chalk inside because the rain may destroy it! If you have a small athlete who's not into drawing, you can build a small climbing wall for him or her! Climbing is an excellent activity for kids; just remember how much you liked to climb trees in your childhood. A climbing wall on a fence has many advantages over a tree. For example, the climbing wall won't be too high, so your child won’t get hurt if he or she falls. Nonetheless, don’t forget to provide a helmet and other safety equipment for wall climbing. A good idea is to put a gymnastic sponge on the floor so when they fall they fall on a soft surface. Safety should always come first, even in your own backyard! A sandbox can be a great addition to your young children's playground, especially if you want to keep an eye on them. Fill the sandbox with interesting toys and they won’t leave the sandbox for hours! Another great idea: you can put an awning above the sandbox to provide shade during hot summer days. Heaven knows sunburns are no fun! 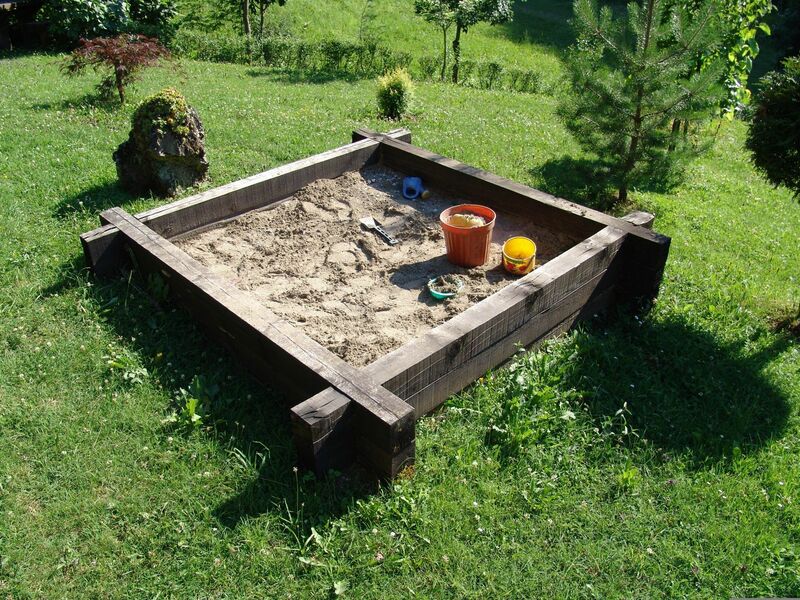 You can buy a sandbox or you can make one yourself; it's completely up to you! If you have small kids, I recommend that you buy a sandbox and fill it with sand because it is easier to maintain it. Also, when your kids aren’t playing in the sandbox, you can close it and store it (which is great). If you place the sandbox on the grass make sure that you occasionally move it somewhere else; otherwise, the grass under it will disappear, and you don’t want to have a bald patch in your backyard. A great feature some sandboxes have for easier transportation is wheels. If your sandbox doesn't come with wheels, you can install them yourself. All you need is a good drill. On the other hand, if you are interested in DIY projects, you can make the sandbox from scratch, but be aware that this is not an easy task. The best option is to make a built-in sandbox, lest you end up with sand all over the yard. In all honesty, this is a project that doesn't require a lot of work, but it is something your kids will enjoy and use for years. Maybe later, when the kids grow up, you can turn it into a nice veggie garden. Yes, more! You might be thinking: “What? Aren't the fence and the sandbox enough?” Well, no! (I'm sure your kids will agree). But I am not talking about filling the backyard with all kinds of toys; I am talking about things you can make for the entire family. For instance, during summer you can have an open air cinema in your backyard. All you need are sheets, tons of pillows, a few movies (or cartoons), and a projector. This is a great way to spend a warm summer evening with the entire family and create wonderful memories that will last forever. The sky's the limit! Turn on your creativity and surprise your kids when summer arrives. You can get an inflatable swimming pool for refreshment and turn your backyard into a tropical resort. While you're filling the pool, the kids can fill the place with Hawaiian decor. They can also make those famous Hawaiian flower necklaces for the entire family. Cool fruit salad, refreshing drinks, and tropical music is pretty much everything you need to relax in your own backyard. Remember to keep your garden well maintained! Having a garden for your kids to run around and play will give loads of peace and joy to your heart. If you don’t have the time, experience or the money to maintain your garden, there are lots of professional companies who deal with residential lawn mowing. Besides the ordinary maintenance, they can give you tips on how to improve the grass and the soil, and even help you decorate that awkward corner in the yard. Turning the backyard into an oasis isn't hard when you know what you're doing. 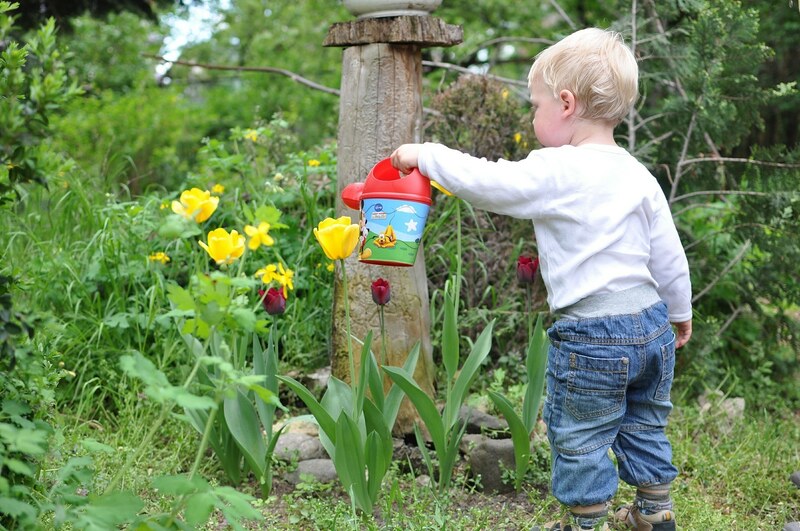 A well-maintained garden is also safer for you, your kids and your pets. You don’t have to worry about unwanted guests in the form of rodents (which is not uncommon for backyards that look like jungles). The same goes for unsightly weeds that consume your plants' vital resources; we all hate those in our backyard! Once they enter your garden, they won’t leave that easily. Most people tend to forget about their backyard for several reasons, especially when it's raining or snowing outside. But don’t let your backyard to get into bad shape for too long; it's harder to fix a problem than it is to prevent it! No matter what you do, remember that a backyard is a place for the entire family. It has to have an adult section for parents, and a kid’s corner for the young ones. You have to look at your backyard as another room in your home. It is a place for you and your loved ones to have a good time, relax, and where your children can have lots of fun. As such, it's important to make it a pleasant space. This is a guest post written by Mark from foosballzone.com. 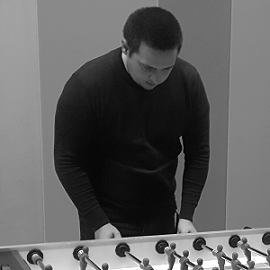 He is a fierce foosball player and he wants to help people choose the best table by writing honest reviews about all the different table bands out there. If you want to learn more about picking the right foosball table, take a look at https://foosballzone.com/foosball-table.